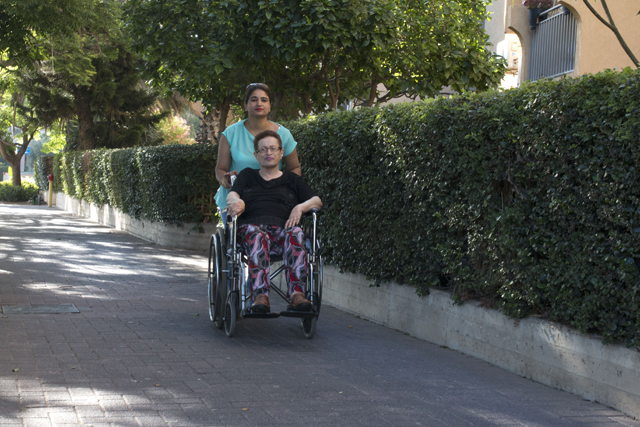 Deepika Bhusal wheeling her employer, Malka Cohen, to the market in the Israeli town of Holon. For the last 10 years, Deepika Bhusal has followed the same daily routine. After waking up, she bathes her employer, prepares her food, gives her medications, takes her out for a walk, puts her to bed at night, and then goes to sleep herself. The monotony is only broken when she has to take Malka Cohen, a 78-year-old Israeli woman with Parkinson’s disease, to a doctor’s appointment. Like most Nepali women in Israel, 32-year-old Bhusal works as a live-in caregiver, a job that requires her to be on call at all hours, leaving no time for social life. The only friend she meets regularly is Uma Chhetri, another caregiver in her neighbourhood of the town of Holon. The two usually arrange to go grocery shopping together. And since they cannot leave their charges at home, they push them along in their wheelchairs. Deepika Bhusal and her employer Malka Cohen with another Nepali caregiver, Uma Chhetri, and her charge. There are about 10,000 Nepali women taking care of elderly Israelis. Of the 60,000 foreign caregivers in Israel, 15 percent are from Nepal, according to KavLaOved, an Israeli NGO that provides advice and legal aid to workers in Israel. Israeli labour laws guarantee workers one day off in a week, but many Nepali caregivers choose to work seven days in return for extra cash. “I am here to earn, so I try to work as much as I can,” says Bhusal, a single mother who left behind her two daughters, now 17 and 15, in her sister’s care in Kathmandu to come here 11 years ago. She paid a recruitment agency $4,300 to find her a job in Israel and arrange her work visa. 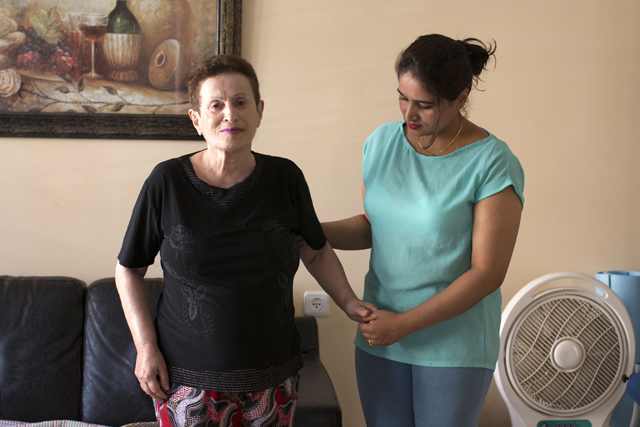 Her first job was caring for an elderly couple in Ramleh, and after the couple moved into a nursing home, Bhusal started taking care of Cohen, earning $1,400 a month, most of which she sends home to pay for her daughters' education. 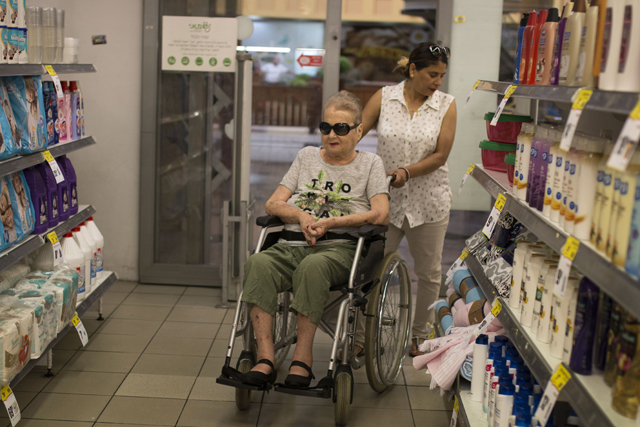 Uma Chhetri and her charge in a supermarket in the Israeli town of Holon. Uma Chhetri, 43, is from Biratnagar, and had to leave behind her husband and two children, which was the hardest part of working overseas. “Even learning Hebrew was not that hard,” she jokes. Israeli law doesn’t allow foreign workers to bring any immediate family members, and if they get married while in Israel their visas are immediately revoked. Despite the isolation, both women said they felt lucky to be in Israel, a much sought after destination by Nepali workers because of its relatively high wages, safe working conditions and strong labour laws. Until 2009, it was fairly easy for Nepali workers to go to Israel. Then the Israeli government banned hiring Nepali migrant workers, citing corrupt practices of recruitment agencies that were charging workers exorbitant fees. The number of Nepalis working in Israel dropped from 7,450 in 2010 to 4,111 in 2016, but the number of undocumented Nepalis in Israel rose in the same period from 5% to 30%. A report by KavLaOved says most Nepalis end up becoming illegal because their recruitment agents fail to arrange visas as required by Israel’s Ministry of Interior. Foreign workers cannot come back after their contracts expire, and Israel is strict about work permit renewals. Foreign caregiver work permits are valid for four years and three months, and can only be extended if they have been with current employers for over a year. In that case, employers have to request an extension of the caregiver’s visa. Two years ago, Israel lifted the ban on Nepali workers and signed an agreement to bring 300 female Nepali caregivers to Israel without recruitment agencies as a pilot project. However, this hasn't deterred Nepalis from coming illegally. Many came to Israel with fake Indian passports when the ban was in place. So far, only 59 women have gone to Israel through the official government program. Nepal's ambassador to Israel, Niranjan Kumar Thapa told us: "The Israelis are very satisfied with the performance of Nepali caregivers, and we hope for an increase in the quota for Nepali caregivers." "Israelis happy with Nepali caregivers"
Newly appointed Nepali Ambassador to Israel Niranjan Kumar Thapa speaks to Nepali Times about the issues facing Nepali workers there in an email interview. Nepali Times: The 2015 agreement signed between the Nepali and Israeli governments to bring in 300 Nepali caregivers was seen as a major breakthrough. However, less than 60 people have made it to Israel through this official program so far. Why is it so slow? Niranjan Kumar Thapa: Yes, we admit that the process has been slow and we’ve repeatedly brought up this issue with the concerned Israeli authority. Their response is that as it is a pilot project, they first need to receive appraisal of the caregivers from their employers. And it's not a one-way process where only the employers’ evaluation matters, even the caregivers are questioned about their job satisfaction so the process is going slower than anticipated. The second group of caregivers has been selected and are now being trained in Kathmandu. We have also received signs from the Israeli side that they are very satisfied with the performance of Nepali caregivers and we hope this will result in an increase in the quota for Nepali caregivers. There’s been an almost 30% increase in the number of undocumented Nepali workers in Israel in the last decade. What is the reason? According to Israeli rules, a foreign worker can only work in Israel for 51 months. Most caregivers continue to stay in Israel after the death of their employers without proper visas. Though the embassy has been discouraging Nepalis from doing this, the number of undocumented workers is increasing. The downside to this is most such workers end up sending money via illegal channels which in turn affects the flow of remittance. The other social repercussion is once they leave the country, they cannot return so they choose to stay in Israel for years which eventually affects their social lives. What are the other issues facing Nepali workers in Israel today? Israel has labour-friendly laws so we generally do not receive complaints about being underpaid or not being paid on time or being mistreated by employers. The most common complaints are about Nepalis lending money to each other and then not paying back. The embassy has requested Nepalis to not engage in such transactions without documentation, but it’s still a major problem. Our other concern is that most workers send money through the Hundi system which is harming the flow of remittance. Despite having access to banks and money transfer services that operate seven days a week, only a small proportion of people send money through formal channels. What are your goals as Nepal's ambassador to Israel? I am going to work on increasing the quota for Nepali caregivers here. Besides that, the embassy also wants to inform the Israeli government that Nepal has skilled labour in other fields as well. Around 8,000 Israelis visit Nepal annually, and we are planning to increase that with promotional activities. During the 2015 earthquake, Israel was quick to send a rescue and relief team to Nepal for which we are very thankful and that showed how prompt and prepared they are in disaster management. Thus, I want to discuss the possibility of bringing in Nepali students to study disaster management here as well conduct disaster preparedness trainings for government agencies. From my interactions with the Nepali community here, I noticed that many have a sense of insecurity about their future in Nepal. So in collaboration with the Israeli government, I want to introduce a concept of old-age homes in Nepal where the caregiver returnees from Israel who have abundant experience of caring for the elderly can use their skills and experience in their own country. I am not sure if I can achieve all these during my tenure here, but I am working on these plans steadily and hoping for the best. "I come from one of those places that you read about and shake your head"
Is peace really breaking out?